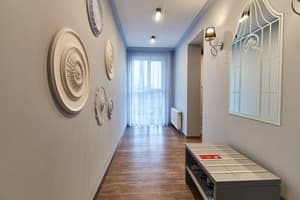 «Light Hotel» is a new, modern business hotel that is located in ten minutes walk from business and cultural center of the city. Calm, elegant and minimalist interior create a comfortable environment for living at a high level. 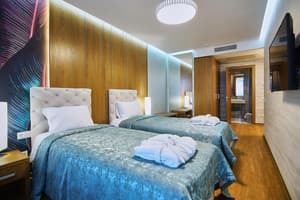 Relaxed atmosphere with a thoughtful approach of lightness to every detail will give you unforgettable impressions about your staying in the hotel. 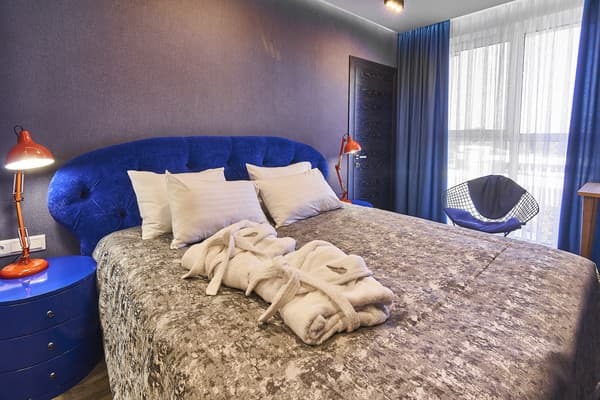 «Light Hotel» offers to its guests 42 comfortable rooms, created in styles: “Classic”, “Jeans”, “Modern”. Rooms in “Classic” style will not leave indifferent connoisseurs of good taste. Perfect forms, laconic colors, exquisite furniture, made in the spirit of lightness and easiness will fill your holiday with unforgettable emotions. 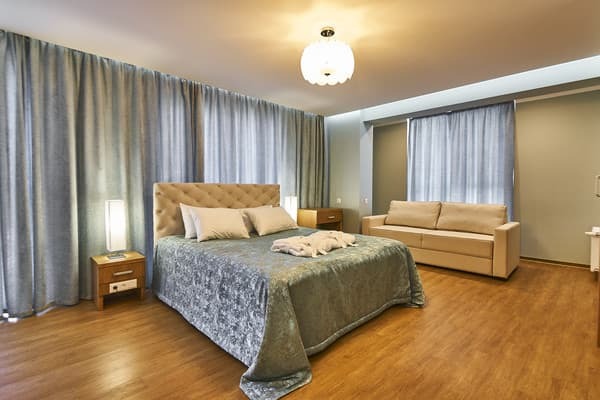 Rooms in “Jeans” style emphasize the subtlety of the image and lifestyle of young generation. You can completely feel the raisin of designer’s solution embodied in a combination of nonstandard color and form. 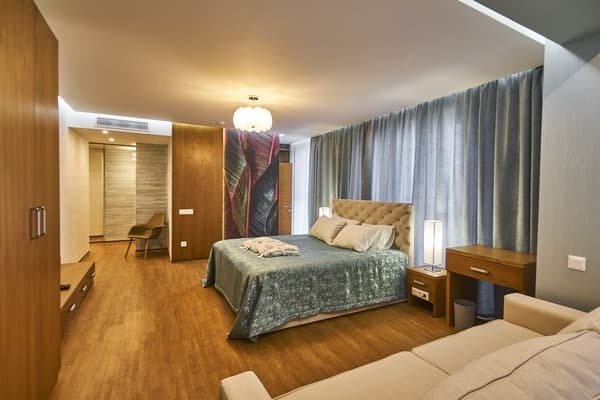 “Jeans” rooms will let you feel freedom, solitude and spiritual harmony. “Modern” rooms intended for seekers of balance between regularity and everyday fuss. In the combination of modern style and wood you can find inner balance and calm by running away from the rapid rhythm of life. All rooms are equipped to the smallest detail so that every guest could feel real comfort. 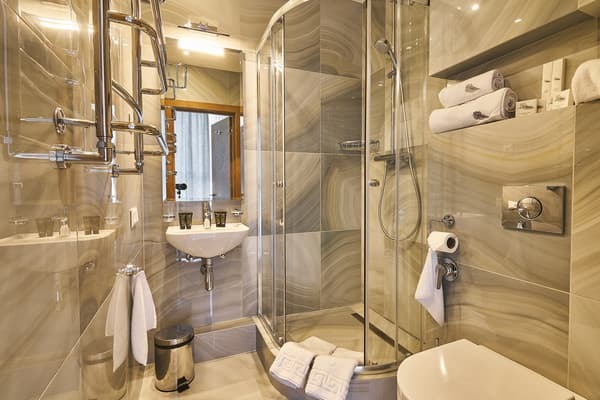 The interior uses first-class textiles, comfortable furniture and high-class sanitary ware. The hotel has beds with orthopedic mattresses, the newest TV systems, Wi-Fi and general air conditioning. High-quality cosmetics and white terry products will let you feel our attention and care, providing you with a feeling of home comfort. You can begin your morning with a delicious breakfast in the restaurant “Gatsby”, which is open for you from 07:00 a.m. The exquisite taste and aesthetics of serving dishes will exceed your expectations. Besides, the restaurant is always ready to become the place for business meetings, family dinners, friendly gatherings and cozy evenings. It’s not necessary to wait for a calendar holiday to indulge yourself with delicious dishes. 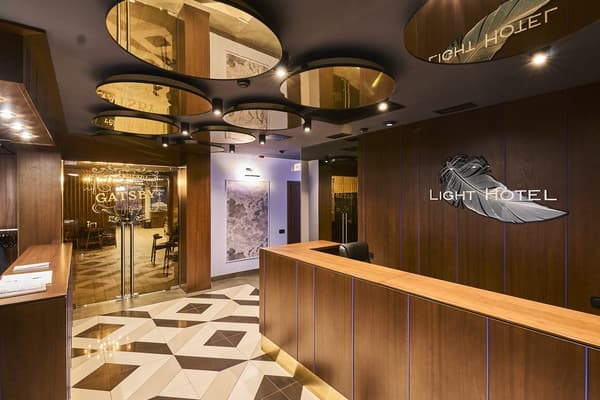 Once you visit the "Light Hotel" you will definitely want to come back again! “Light Hotel” - Lightness in all details! Terms of accomodation: 1. Check-in time: 02:00 p.m., check-out time: 12:00 p.m. 2. Check-in at the hotel is possible with the availability of national passport or other identity documents. 3. The payment for accommodation is charged in the full amount for the whole period of staying at the check-in. 4. 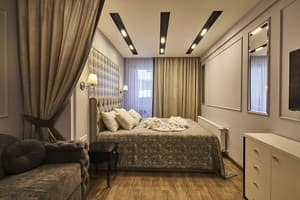 The calculation of payment for accommodation begins from the fourteen hour of the day when the Guest arrived, despite the actual time of arrival. When staying is less than one day, payment is made for the whole day, despite the check-out time. 5. Early check-in (until 11:00) and late check-out (after 13:00) are charged additionally according to the approved rate. 6. The Guest can extend the staying with the consent of the Administration and if the hotel has available rooms. 7. Breakfast is included in the room rate “Continental”/”a la carte” or "Buffet". 8. Breakfast time: from 07:00 a.m. to 10:00 a.m. Additional charge: 1. Children up to 2 years old can be accommodated free of charge in the same room with their parents without an extra bed. For accommodation children over 2 years old and adults at an extra bed in the room payment is charged in accordance with the Hotel’s price list. 2. 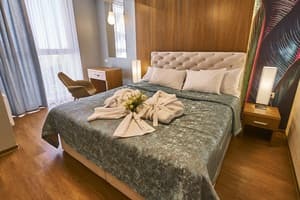 The Guest has the right to invite visitors to the room from 07:00 a.m. to 23:00 p.m. 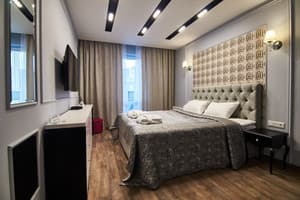 If the visitor stay in the room after 23:00, the guest have to pay for an additional place in accordance with the Hotel’s price list. 3. Early check-in from 6 a.m. to 11 a.m. is paid 50% of the room rate. 4. Late check-out after 1 p.m. to 11 p.m. is paid 50% of the room rate. 5. 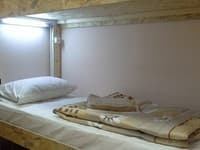 Accommodation of more than two people should be paid extra 500 UAH per person. 6. Price of the parking is 100 UAH for 1 place per night. 7. We organize transfer from Airport, railway station. 8. Tourist tax – 1% is additionally paid. 9. Parking is paid 100 UAH per day per car. Breakfast is served in the GATSBY restaurant from 07:00 to 10:00 a.m. (if you need an early departure, we provide lunch boxes). Room Service (delivery of food and drinks) is 10% of the cost of the order. You can reach us by public transport, taxi, transfer from the Hotel.